Hiking - there are guidebooks in the section Tourist guides, hiking, backpacking - Slovakia. Look for the Knapsacked travel in Slovakia series. 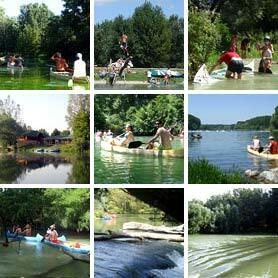 Paddling trips on the Danube River from Orth to Bratislava. Paddling trips in Central European Amazonia. Whitewater rafting on the Vah River (Liptov). Whitewater rafting on the Dunajec River, Pieniny (Zamagurie).